Industrial Designers’ Society of Turkey (ETMK) was established by a group of industrial designers in Ankara in 1988. Its Istanbul Branch was opened in 1998, Izmir Branch in 2010, and Ankara Branch in 2012. ETMK organizes exhibitions to raise awareness of industrial design and to increase the demand for the professional service, and awards to increase the quality of designed products. Since 1994, the number of the exhibitions has become more often in recent years, where ETMK invites the industrial designers and the manufacturing companies to participate with their products, and brings the designers and the industry together. The very first product design exhibition ETMK organized was the Designers’ Odyssey in 1994, on its fifth anniversary. Designers’ Odyssey was the first product design exhibition in Turkey, and appeared in September 1994 in Construction Fair in Ankara Altınpark Expo Center, and later in October 1994, in the International Symposium on Industrial Design organized by Middle East Technical University, Department of Industrial Design. Thirty-three designers participated the exhibition with more than a hundred products, and five Products, two Conceptual Projects and four Student Projects were awarded the ETMK’94 Design Awards. 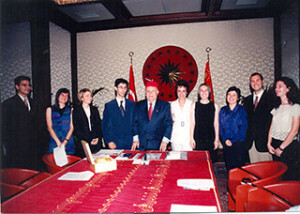 The second exhibition was Designers’ Odyssey ’98: The Adventure of Turkish Designers in TÜYAP Beylikdüzü Fair and Convention Centre, and sponsored by Nurus, in November 1998. 107 designers participated the exhibition with their 256 products, three of which were awarded with ETMK ’98 Product Design Awards by an international jury. Four out of 150 participating student projects were also awarded with ETMK ’98 Encouragement Prize. ETMK participated Tidex ’95 International Design Fair, in parallel with ICSID ’95 International Design Congress in Taiwan, and made a presentation of 200 slides, which found its place in Taiwanese media. ETMK participated “ADesign Fair 2003” in Lütfü Kırdar ICEC between September 10th to 14th, 2003, with the Product Design Exhibition “Beyond Borders”. The main aims of this exhibition were to raise awareness about industrial design with its important role in global competition, to reveal the national repertoire in the field, and to enhance the relationship between the designers and the industry. The same exhibition appeared in Foreign Trade Complex in Yenibosna in the context of “Surplus Value” Design Exhibitions organized by Turkish Exporters Assembly in January 2004, and in Gaziantep in July 2004. Upon Messe-Frankfurt’s invitation to Tendence Lifestyle 2004, ETMK participated the event with Design from East to West – Designers from Turkey Exhibition. The exhibition met the Turkish audience in ADesign Fair 2004 between October 4th and 10th, 2004 in Istanbul. The digital images of the exhibited products appeared in INTERLIGHT 2004 Fair at the same time. In the scope of ADesign Fair 2004, ETMK supported ADesign Fair 2004 Design Awards of the Year, and presented ETMK 2004 Young Designer Award. Next year, in the scope of Istanbul Design Week, ETMK supported ADesign Fair 2005 Design Awards of the Year again, and presented ETMK 2005 Young Designer Award to promote young designers representing the future of Turkish design. With the aim of bringing the increasing importance of design’s role in competition for our country to the agenda, ETMK organized the exhibition “Creating Difference by Design in 2000s” in the scope of Marketingist 2005 Marketing Fair and Conference in TÜYAP Beylikdüzü between October 27th and 30th, 2005. The products manufactured in Turkey in the last five years, and made difference by their design were presented to Turkish public opinion, industry, advertisement, marketing and design sectors. The exhibition was supported by TİFAŞ and Turkish Exporters Assembly. ETMK continued emphasizing the competitive role of design next year with “Winners by Design ETMK 2006 Product Design Exhibition” in Marketingist Marketing Fair 2006. 66 products from 12 sectors participated the exhibition, supported by TİFAŞ and Turkish Exporters Assembly. The exhibition appeared from September 28th to October 1st, 2006 in TÜYAP Beylikdüzü. Five products were elected by the election committee for the “Winners by Design ETMK 2006 Awards”. The awarded products were exhibited in Istanbul Technical University from December 6th to 22nd, 2006 together with the contemporary Finnish design examples in the “Global-Helsinki” design exhibition supported by The Embassy of Finland. The second “Winners by Design” exhibition came next year’s Marketingist Marketing Fair. Winners by Design ETMK 2007 Product Design Exhibition took place in TÜYAP Beylikdüzü between September 20th and 23rd, 2007 and was again supported by Turkish Exporters Assembly and TİFAŞ. The exhibition included 48 products by 47 designers, manufactured and marketed in the last three years. The committee awarded four products with Winners by Design ETMK 2007 prize. In its 20th anniversary, ETMK developed an award scheme to emphasize the strategic importance of industrial design for the country. This system was started by the Ministry of Economy, Turkish Exporters Assembly and ETMK in the scope of Turquality programme. The biannual Design Turkey Awards which started in 2008 is approved by ICSID (International Council of Societies of Design). Design Turkey Awards evaluates the marketed products which are either designed, or manufactured or branded in Turkey.